I’m back from a few weeks of vacation in beautiful Sydney, Australia’s energetic cosmopolitan hub, and no place in the world quite like it Hawaii. Despite the marathon-long flights to get to each destination and the jet lag that quickly ensued, I can’t imagine ever tiring of either Sydney’s or Hawaii’s sunny climate, nature, word-class beaches and diverse cuisine—in Sydney, chefs are using multicultural inspirations to create a Modern Australia (Mod Oz) cuisine and in Hawaii one can explore the blending of European cooking with unique influences of Asia and the Pacific. Both locales are exciting destinations for anyone who loves unique flavors, fresh organic produce, or just great food. Besides an adventurous culinary culture, the legacy of Captain James Cook, friendly people, and a lovely climate, the two areas share something else in common—the production of macadamia. Although Hawaii helped to place macadamias on the international stage, and is currently the largest exporter of macadamia nuts, the buttery-tasting nut is actually indigenous to Australia, the world’s largest commercial producer of macadamia. Macadamias, like many other nuts, actually have major nutritional benefits. They are an excellent source of two nutrients, manganese and the B vitamin thiamine, that are vital for healthy brain and nerve function. Although macadamias are packed with a lot of fat, you can rest easy as most of it is the unsaturated kind. 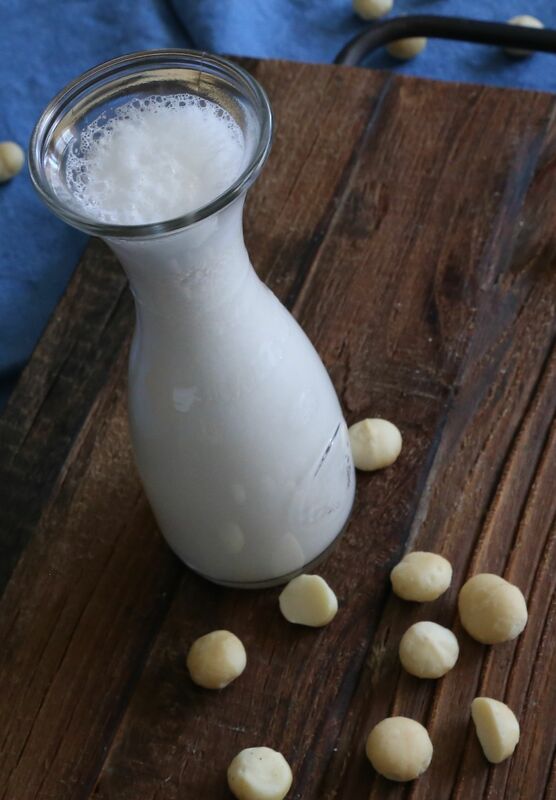 Inspired to find ways to add more macadamias to my diet, I made macadamia milk. Similar to cashews and cashew milk, macadamias are a soft nut, need little soaking time, and don’t require straining. However, if you prefer your milk smooth, a nut-milk bag will come in handy. Either way, a creamy buttery macadamia milk will result. Place the raw macadamias in a bowl and cover them with water. Soak macadamias for approximately 4 hours. Drain the macadamias and rinse, using plenty of fresh water. Put the macadamias in a high-speed blender (I use a Vitamix) with 3 cups of water. Blend the macadamias at high speed until very smooth and creamy. Add more water for thinner consistency, if preferred. You can enjoy it unsweetened and unflavored, especially if you will use it for soups and sauces. Or you can flavor your freshly made macadamia milk to suite your own taste. I added a few dates and a teaspoon of vanilla to mine, but feel free to be creative. Like other nut-milks you can sweeten yours with dates, raw honey, maple syrup, etc. You can also flavor your milk with cinnamon, vanilla, cardamom, fresh fruit, cacao powder for chocolate milk, etc. Go nuts! The sky is the limit because the possibilities are endless. What a lovely idea! Macadamias are one of my favorite nuts. And your vacation sounds fabulous!! Thanks Patty! Great flavor and so many things to do with macadamias, no wonder why they’re one of your favorites! Yes, are vacation was fantastic. So much to see and do! I wish I had time to share more! That’s so lovely and nice that you still spend quality time with your parents. I’m hoping to create such memories for my son so he can look back with the same kind of fondness. It’s true family vacations are priceless. Thanks for commenting and sharing! You sound like you have a wonderful family. You do love your nut milks. This looks like a beautiful recipe, and Australia sounds like a lot of fun. Thanks Shanna. As I don’t drink cow’s milk and try to avoid too much soy, I do love to explore other alternative nut and seed milks. I’ve been meaning to share my hazelnut milk too! Soon. Yes, my small and short glimpse of Australia was indeed fun. Thanks again.